There is a little doubt that a segment of the sports press and the public would prefer that athletes with conservative and Christian beliefs keep their views to themselves (but secular and leftist views are fine). 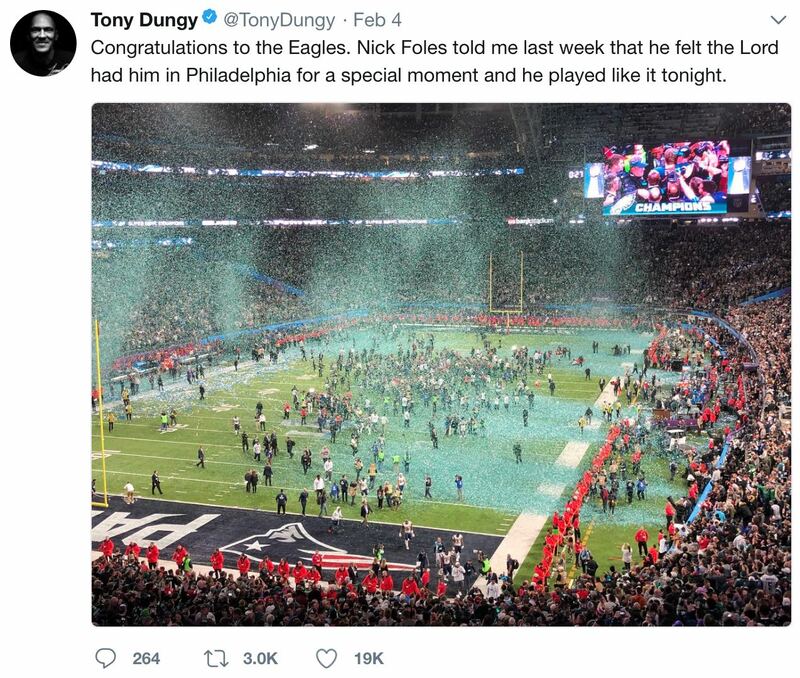 This became evident after the Super Bowl, when one sportswriter and the Twitter mob strongly criticized NBC's Tony Dungy, a Super Bowl-winning coach himself, for citing Philadelphia Eagle quarterback Nick Foles' self-professed Christian faith as contributing to his success. These people wanted — no, really expected — Dungy to not relay what Foles, the team's backup quarterback until became its starter after Carson Wentz's season-ending injury on December 10, told him about his mindset ahead of the big game. Oh my. Foles cited the Lord, and Dungy told everyone. Pass the smelling salts. Note that Dungy (and Foles) are both mature enough not to claim that the Eagles' victory was God's will, or that Foles won because he might be a stronger Christian that New England Patriots' quarterback Tom Brady, as one unhinged Twitter critic charged. Dungy simply believed Foles' "Christian faith would allow him to play with confidence." Those statements were too much for Kyle Koster, a Senior Writer at The Big Lead, to handle. ... it would be naive to think Dungy trumpeting the benefits of faith is something being done from a distance while only wearing an analyst’s hat. .... His long history of evangelizing must be weighed. In other words, if you evangelize on your own time, anything you say as a sports analyst will receive greater scrutiny, because, well, we've got to make sure that "evangelizing" doesn't occur on the air. Dungy expressing his beliefs on his personal time and platform is one thing. ... But when his beliefs seep into his analyst role — either unintentionally or otherwise — they should be checked, both by NBC and the public. No, Mr. Koster. All Dungy did is tell the public what Foles told him and compliment his play. Koster clearly believes that a sports journalist shouldn't be allowed to do that if icky Christianity is involved, and that NBC and "the public" should stop someone who tries. This is the same mindset possessed by broadcasters who routinely censor athletes thanking God for their success after games. Koster's hostility also came through in a separate Wednesday tweet: "Nick Foles was a Christian when he wasn't very good at football, too."